For other uses, see Boardwalk (disambiguation). 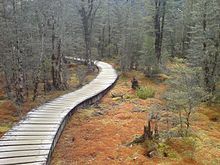 A typical nature boardwalk, carrying walkers over wetlands on the Milford Track, New Zealand. A boardwalk (board walk, boarded path, promenade) is an elevated footpath, walkway, or causeway built with wooden planks that enables pedestrians to cross wet, fragile, or marshy land. They are also in effect a low type of bridge. Such timber trackways have existed since at least Neolithic times. An early example is the Sweet Track that Neolithic people built in the Somerset levels, England, around 6000 years ago. This track consisted mainly of planks of oak laid end-to-end, supported by crossed pegs of ash, oak, and lime, driven into the underlying peat. The Wittmoor bog trackway is the name given to each of two prehistoric plank roads, or boardwalks, trackway No. I being discovered in 1898 and trackway No. II in 1904 in the Wittmoor bog in northern Hamburg, Germany. The trackways date to the 4th and 7th century AD, both linked the eastern and western shores of the formerly inaccessible, swampy bog. A part of the older trackway No. II dating to the period of the Roman Empire is on display at the permanent exhibition of the Archaeological Museum Hamburg in Harburg, Hamburg. A duckboard is a type of boardwalk placed over muddy and wet ground. During World War I, duckboards were used to line the bottom of trenches on the Western Front, as these were regularly flooded,  and mud and water would lie in the trenches for months on end. 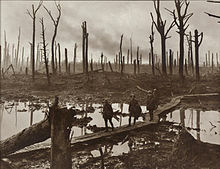 The boards helped to keep the soldiers' feet dry and prevent the development of trench foot, caused by prolonged standing in waterlogged conditions. They also allowed for troops' easier movement through the trench systems. Combat troops on nearly all sides routinely wore hobnail style "Trench Boots" that often slipped on the new duck boards when they were wet, and required extra caution. Falling or slipping off the duckboards could often be dangerous, even fatal. Unfortunate soldiers were left struggling to rise under the weight of their equipment in the intractable and sometimes deep water or mud. If this happened at ground level during a tactical advance, the rising soldier could be left a defenseless target for enemy fire as well as hinder forward progress. He could also simply go unnoticed in the ensuing melee, and easily drown under his heavy equipment. The boardwalk in Ocean City, Maryland, a wooden pathway adjacent to the beach that is lined with businesses, typical of boardwalks along the East Coast of the United States. Many waterfront commercial boardwalks in the United States have become so successful as tourist attractions that the simple wooden pathways have been replaced by esplanades made of concrete, brick or other construction, sometimes with a wooden facade on the surface and sometimes not. One of the earliest such boardwalks was designed in New Jersey and opened June 26, 1870, in Atlantic City. A wooden boardwalk allows passage through a lake, such as this one in National Park Plitvice Lakes, Croatia. This boardwalk allows people to cross Horicon Marsh. Boardwalks help walkers navigate difficult terrain as at Pyhä-Luosto National Park in Lapland, Finland. A boardwalk enables those on foot to cross a bog in Estonia. Wikimedia Commons has media related to Boardwalks. Look up boardwalk in Wiktionary, the free dictionary. ^ The numbering of the trackways No. I for the younger northern one and No. II for the older southern one follows the local archive file of Archaeological Museum of Hamburg corresponding to early publications, in contrast to that Schindler uses a different numbering in his publication. ^ "Definition of DUCKBOARD". www.merriam-webster.com. ^ "Laying the duckboards, France 1917". www.awm.gov.au. ^ "Today in History". loc.gov. Archived from the original on 10 July 2015. Retrieved 9 July 2015. This page was last edited on 31 March 2019, at 05:58 (UTC).